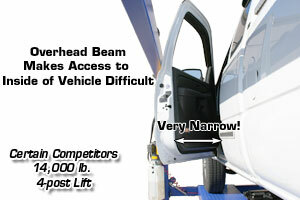 Certain competitors offer a 14,000 lb. 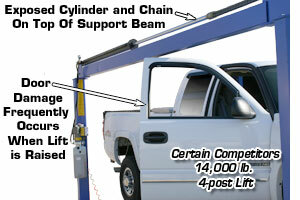 4 post lift for less than $3,000.00. We have purchased one of these 14,000 lb.(??) capacity lifts from a certain competitor. This 14,000 lb. 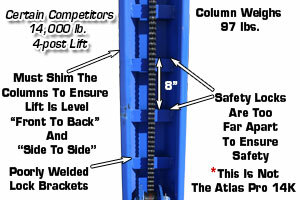 lacks the quality, size, and features found on our Atlas® 414 four post lift. 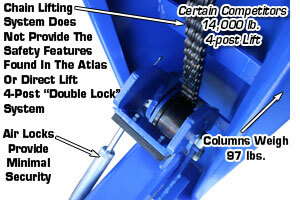 Certain competitors claim their old style chain four post hoist is equivalent to the Atlas® 414 four post lift sold by Greg Smith Equipment. 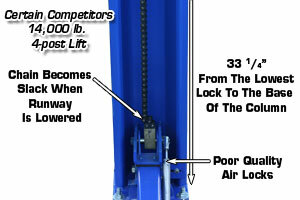 Please review the pictures below and compare the features and quality of this obsolete chain style four post lift to the Atlas® 414 four post lift. 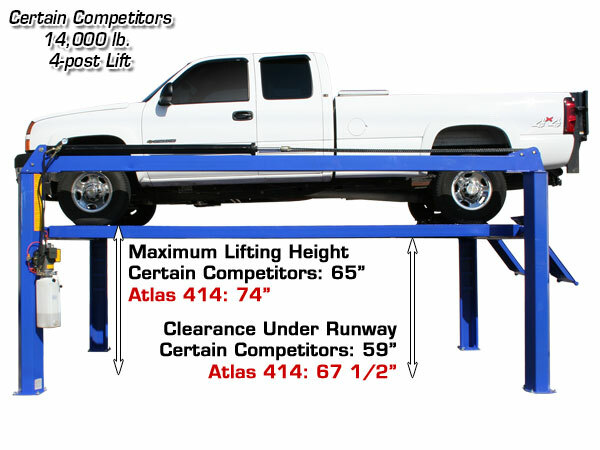 Many Internet resellers continue to EXAGGERATE the lifting capacity of their lifts for the sole purpose of gaining an unfair business advantage. 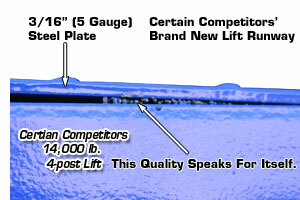 These same competitors exaggerate the shipping weight of their lifts in an effort to convince a potential customer that their lifts are built stronger because they contain more steel. 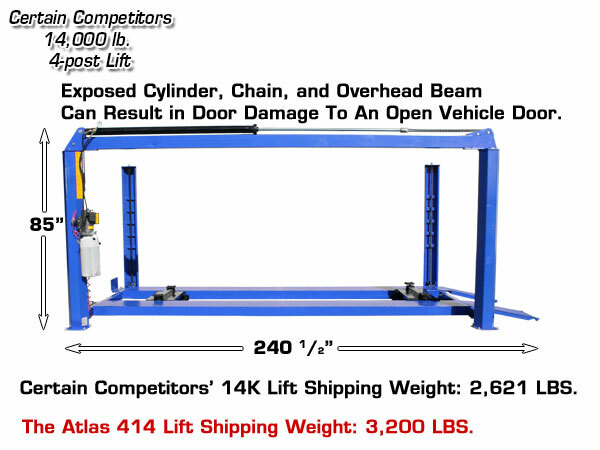 If certain competitors EXAGGERATE the capacity and shipping weight of their lifts to gain your business; can you trust them on other products? 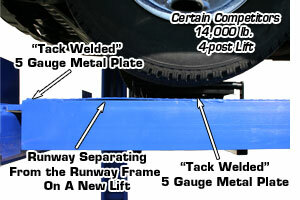 If they do not stock the lifts, you can be sure that they do not stock the parts either! Some Internet salespeople will tell the customer that they are able to rate their lift at a higher capacity because their manufacturer uses special steel or a better (more powerful) power unit. Not true! 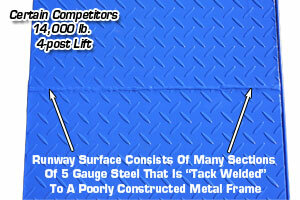 Capacity 14,000 lbs. 14,000 lbs. 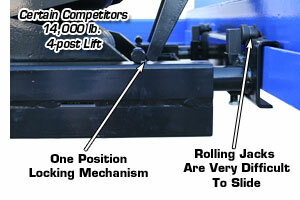 Shipping Weight w/o Motor 3,200 lbs. 2,621 lbs. 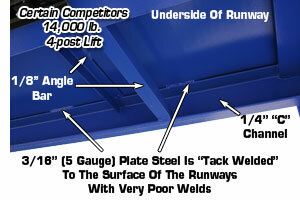 Length w/o Ramps 217 3/8" 208"
Floor Width 127" 124 1/2"
Clearance Under Runways 67 1/2" 59"
Clearance Between Columns 116" 109"
Distance Between 45 1/2" 41 1/2"
Thickness (Height) 6 1/2" 5"
Dimensions 8 1/2" x 5 1/2" 10" X 5 1/2"
Base 12" x 9 1/2" 10 1/2" X 10 1/2"